Ever since Windows 10, the start menu search has been abysmal. I mean, it couldn't find files properly, it missed the obvious searches even with correct pronunciation and words. Rather than showing your files, often times you will be treated with Bing search results. The "Best Match" Bing results are not at all useful when you are actually searching for local files. In fact, unless you store all your files within the library folders (like documents, pictures, downloads, etc.) or on the desktop, you simply cannot search for your files in the start menu. With Windows 10 version 18267 (19H1), it's all changing. Microsoft is finally listening to its users and added a new feature called enhanced mode for search indexer. By turning on the enhanced mode for search indexer, Windows will index your entire hard drive thus improving the start menu search in Windows 10. This extended indexing will let you search and find files located anywhere in your hard drive. To turn on or off enhanced mode for search indexer, we are going to use the Settings app. 1. Open the Settings app by pressing the keyboard shortcut Win + I. You can also open Settings app in Windows 10 from the notification area. 2. In the Settings app, go to the "Cortana" and then "Searching Windows" option. This is where you can control the Windows search using enhanced mode for search indexer. 3. 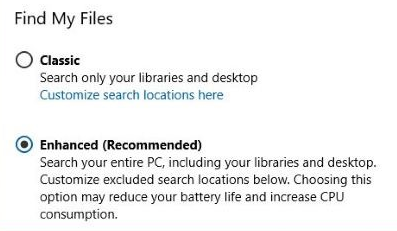 In this page, select "Enhanced (Recommended)" option under Find My Files section to turn on the enhanced mode of search indexer in the start menu. As soon as you turn on the enhanced mode of search indexer in the start menu, Windows will start the one-time indexing process. Depending on the number of files you have and the hard drive size, the indexing will take some time to complete. The first-time indexing process is resource intensive. So, if you are on a laptop, plug it in so that it can work at full speed without any limitation. According to Microsoft, it will take about 15 minutes to start seeing the results in the start menu search. Of course, after the one-time indexing is complete, Windows will keep the indexing up-to-date automatically. Since Windows only scans for changes, it will not be as resource intensive as the first-time or one-time indexing. The good thing about the Enhanced mode in the settings app is that it allows you to exclude folders from indexing. This is helpful if you don't want certain files and folders to be indexed and searchable in the start menu. To exclude a folder, click on the "Add an excluded folder" button and select the folder you want to exclude from search indexing. To turn off enhanced mode for search indexer in Windows 10, you simply have to select the "Classic" option under Find My Files section. This option will limit search indexer to index only the libraries and desktop. Check out sticky notes keyboard shortcuts to improve productivity and get most out of sticky notes app in Windows 10.